I don’t really like cheese. I know it’s anathema to admit that out loud but the prospect of ordering a cheese course at a restaurant makes me cringe. Goat cheese, Camembert, blue cheese. Blech! In my world, blue’s a color, not a food. I think the problem is that I grew up eating Kraft singles and I continued to define cheese as neon orange squares, plastic-wrapped and eaten with Ritz crackers long after I stopped shopping at Kids Gap. Ok, so not much has changed. I’m still petite enough to shop at Kids Gap and I still like Ritz with Kraft singles. You'll be pleased to know I recently discovered that I like Brie. Not because I was trying to broaden my cheese horizon but rather, because Brie reminded me of cream cheese. Don't hate because I'm a true gourmand :). 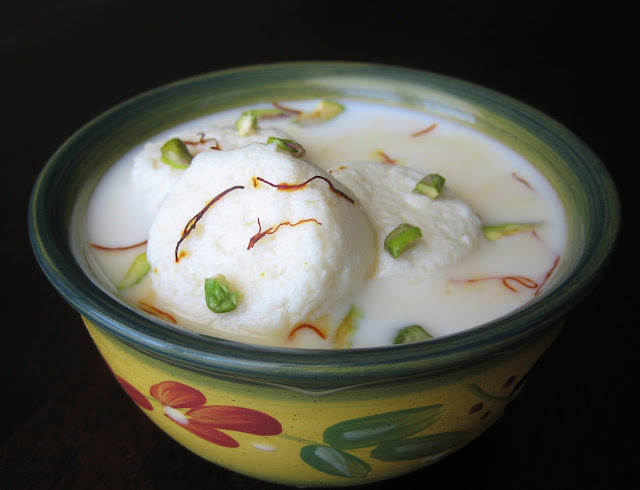 In light of my (extremely) limited cheese experience, it's particularly surprising that one of my favorite South Asian desserts is ras malai, or paneer in sweetened milk. Holy Batman, that even sounds unappetizing to me and I've been eating it for years. Let me elaborate. Paneer is a particularly mild, fresh cheese with no real flavor of it's own. As a result, it works really well in different contexts from main dishes to desserts. It's basically the tofu of the dairy world. Remember your last stroll through your local Indian buffet? Remember the palak paneer? Same paneer (but in a savory, spinach sauce). Whew, that explanation sounds much better than paneer in sweetened milk. While I was growing up, my mom always made ras malai, complete with homemade paneer. There are numerous videos on the internet for the "I make my own bread, grow my own vegetables, raise my own cow" group of foodies inspired to make their own paneer. I should warn you though that it takes f o r e v e r. The voices in your head chanting "dessert now, dessert now" hit an all time high as you watch the moisture s l o w l y drip out of your paneer. There is a shortcut. Ricotta cheese. I know, I know, numerous South Asian grandmothers just rolled over in their graves. But it's true. Ricotta cheese has an eerily paneer-like consistency without the drama of making paneer. Mix the ricotta with sugar, spread in a baking pan (or if you insist on making things more complicated, use a mini muffin pan for cute, little, paneer rounds), and bake until firm. Wait (impatiently) until the rounds are cooled, add to cooked, sweetened milk, refrigerate, and gobble quickly. If you're feeling fancy, you can cook the sweetened milk with cardamom and top the entire concoction with pistachios and saffron threads but note the whole garnishing business takes more time (which means it'll be longer before you can eat dessert). The voices in my head prefer the ricotta cheese route but if you have a Sunday afternoon, a container of whole milk, a cheesecloth, and a hankering for paneer making, go at it. Just be sure to have some brownies at your disposal to appease the dessert-craving voices in your head while you wait for the paneer. Gently mix 1 cup of sugar with the ricotta. Spread in a dish or spoon into muffin pan and bake for 20-35 minutes. After 20 minutes, peer into the oven every five minutes (feel free to insert a toothpick into the middle of the ricotta mixture to check). The ricotta should not be born but should be cooked fairly thoroughly such that there is no clumps on the toothpick. Cool completely. Cut into squares if necessary. Mix 1/2 cup of sugar with milk and cream. You may want to add more sugar depending on preference. Cook on low heat until mixture thickens. Remove cardamom seeds from the pods and crush some of them. Add to the thickened milk/cream mixture. Cool completely. Add cheese cubes to milk/cream mixture and refrigerate for 2 hours (or until chilled). Top with chopped pistachios and saffron threads. I love shortcuts and anything to make life easier :D Bookmarked! Sometimes life's too short to wait that long for dessert! I'm a goober, though - until you got to the pistachios part, I was wondering why your dessert had green onions on it. :D Sounds awesome. ps, I was mentally arguing with you at the "when I stopped shopping at Kid's Gap" part, so the next sentence totally cracked me up. You're in mah branes! Cheese and I are the best of friends so I think I may have to try this. Can't you purchase paneer at the store? I could have sworn I saw it in a little Indian market. If not, ricotta it is, 'cause there are some things that need to be bought at the store and not homemade ESPECIALLY when dessert is concerned. BTW, you could totally grow mint. It grows like a weed and only needs to be watered once a week. Rosemary and thyme are pretty easy too, but basil is a bit more fickle. oooo..love these delightful little goodies..i made paneer cheese last year and keep telling myself to do it again..the ricotta seems like a swift alternative. I had no idea that ras malai was made from paneer - that explains so much ;) If you discovered brie and like it (my fav is triple creme brie) you might want to use Humboldt Fog as another branch out point or those cute little rounds of flavored chevre (pepper, herb) at Trader Joe's. What a beautiful dessert! I don't like paneer, but I love ricotta. I'm glad you took the shortcut because I'd be willing to try this with ricotta. :) That's funny about Gap Kids...I used to buy kids' clothing for myself too b/c it was cheaper. Yummy. You're right, I want this right now. Too bad there's nowhere close that serves it. I would like to attempt using the ricotta. Great shortcut. Love cardamom, pistachios and saffron - all regular staples in my pantry. Neat post. You don't like cheese! Have you seen my profile pic! I thought we had so much in common :( Boooo! What a well written post! Really engaging! Also, love the part with the cardamom. Definitely going to make it. Had a soupy dish with cardamom at an Indian restaurant that I fell in love with and that I could never seem to find again. . . The Housewife- I agree! Life is way too short to wait for dessert! Denise- We would definitely be friends because you seem fabulous! The picture is beautiful but I can't take credit for that. The hubster has kindly "agreed" to be the blog's official photographer. LisaP- I do want to make some green onion pancakes soon so you may be on to something there! Oh, and I'm convinced that even your youngest daughter is cooler than me and no longer shops at Kids Gap. S- I'm sure you can purchase paneer but the lady at my local Indian place scares me. She reminds of the soup Nazi (minus the delicious soup)! OC- Thanks for the fabulous options. I don't like having the cheese palate of a third grader so I will be trying some of your suggestions. Judy- I think I may prefer the ricotta version to the paneer one as well. I feel like it's moister. And sadly, many of the kids in Kids Gap are bigger than me. 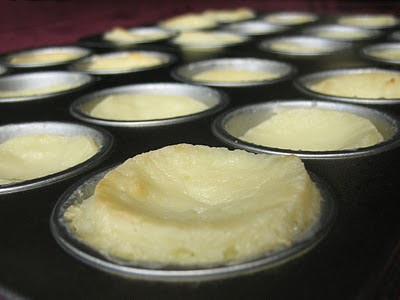 I like the idea of baked sweetened ricotta in the mini muffin pans, that would be a nice dessert! And ricotta is one of the ingredients I always have on hand. I am a cheese addict so this is right up my alley. Now I want a ras malai right now lol. I would think that you can use ricotta in many dishes and use it as an alternative! Nothing wrong in not liking cheese, besides it's full of fat :o) - beautiful little desserts, love it! One of my sisters doesn't like cheese at all, so I understand. I love the shortcut! Wonderful post. Although count me amongst the cheese lovers. Looking forward to following you here. Lovely post. I love cheese but cannot eat too much. Sometimes I wonder whether I am lactose intolerant. That would be a big blow if it is.I'm happier not to know :P Love the short cut here. Thanks very much for sharing. yummmm, love ras malai and love your sense of humor. Thoroughly engaging post. Fell on your blog quite by accident, but a very happy accident as I had a really heavy day at work and reading your blog has put a really big smile on my face :DD. Your writing is very fluid and interesting. I look forward to more. Lol! I love how you say 'numerous South Asian grandmothers rolled over in their graves' that's exactly what my mom says especially when I try to 'thinly' slice onions then give up and use the medallion! Azmina do you live in Dallas?? This looks delicious, I am all over this dessert -- I recently discovered the beauty of cardamom and haven't turned back since. Anyways, if you do live in Dallas we should go get drinks! I keep trying to be a person who likes cheese, but my tastebuds reject anything with too strong of a flavour. Blue cheese? Why would anyone want to eat that? Oh, but HOW? How could one possibly go wrong with Ricotta and Pistachios? One could not. No indeed. OMG that first picture babe is a killer! I make rasmalai with milk powder which I knw makes people turn in grave too but HELLO it tastes awesome and melts in your mouth! I have not made it with paneer even though I make paneer occasionally at home! (certainly not when I'm craving something sweet, I totally agree with u there, if u want sweet, for God sake make a brownie and I would go ahead and use cake mix. Yes)Ok so the point is I don't buy ricotta either. 16 oz of ricotta here, costs at least one arm or at least 5 fingers!But I want to try this. And now I think I going to give up 5 fingers. Just coz of u. YOU! great idea!! but at what temperature did u bake them? The first of the items, HCG, is a weight loss supplement achieving phenomenal consequences. h - CG injections. In the afternoon lunch, the diet plan suggests 100 grams of light proteins. eaten by the hunter gatherer tribes that lived in the Paleolithic era. and our body will demand a higher intake of calories. These markers help with diagnosis but aren't always a hundred percent full proof. proven to be quite accurate. These oral drops are possibly the easiest and healthiest way to administer the hormone in your body. Once you do the Hcg diet protocol, you can consume that one thing.